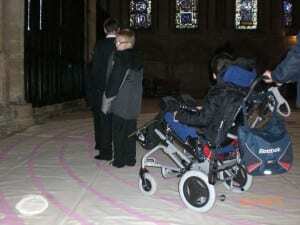 This page contains information about Labyrinth projects in Lincoln, Edinburgh and Canterbury. 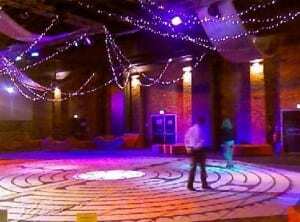 I was first initiated into the labyrinth when I attended a week-end workshop facilitated for the first time in the UK by Lauren Atress herself. 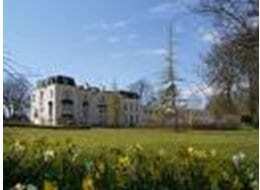 It took place at Winford Manor just outside Bristol in the summer of 2001. Lauren Artress, from Grace Cathedral, San Francisco, is generally credited with being one of the first to rediscover this long-forgotten spiritual tool in the early 1990’s. It was the 11-circuit labyrinth at the medieval cathedral at Chartres in France which She became so committed to opening up the experience of walking a labyrinth for as many people as possible that she set out to ‘pepper the planet’ with them – and she has been very successful in dong so, through such workshops as the one I attended at Winsford, which couldn’t be succeed in enthusing the many participants who went out to ‘spread the word’. I returned to Lincoln, and enthused about the experience to my colleague, senior student counsellor, Eunice Mather. Together we formed a pact to make our own canvas following the instruction pack available form Grace Cathedral. This we did in the last days of December 2002 in the Atrium of the University of Lincoln, together with a team of friends, who were never-the-less strangers to each other at the outset. This was an experience in itself, tackling a project unfamiliar to all of us. A local canvas supplier, more used to making hoods for tractors and sports-cars, as well as awnings and tarpaulins, hemmed and stitched on the Velcro to provide us with the carefully measured three-pieces that were required. A labyrinthograph was devised so that the circle outlines could be traced, and a pattern for the 6-petalled centre rose was made using an over-head projector strategically positioned a precise distance from the wall-come-easel. The work began. We had no idea how long it would take. We were indebted to the intrigued security personnel with their CTV who unbeknown to us were the first to trace the pencilled route, but found it to be impassable because of an assumption at the tracing out stage that the design was symmetrical right and left. We were profoundly grateful for this early alert. And so the lengthy process of painting in the lines which delineate the path began. We each began at a different place. It was absorbing work which required concentration so we found ourselves working largely in silence. We had to work in winter daylight which came in through the north-facing glass wall as the computer-controlled artificial lighting in the Atrium hadn’t been sufficiently programmed ahead to come on during this otherwise closed period. After all we were grateful interlopers taking this one-off opportunity when the space wasn’t in use. We came to experience how darkness fell early and quickly on these the shortest days of the year, and there was no choice but to cease work promptly. On the third day as we resumed after a short lunch break, it was looking because of the amount of work still yet to do that we would run over into a fourth day. We worked on in silence. As darkness promptly fell we looked to see how much remained to be completed. But no, that last brush-stroke of paint was the last stoke required. It was complete. It was as if the design had risen through the floor to leave its fine-looking imprint on the canvas. A new labyrinth had been born. It seemed to be alive. We named it the Ermine Street Labyrinth after the ancient Roman Road that connected Lincoln to York – but now for much of its length is the present day A15 + Humber Bridge – which connected the two campuses of the University – and along which Eunice and her friends had travelled so many times. rts Centre ‘s Dance Studio. Finding a floor space large enough 40’ x 40’ – would often be a problem, as any building where a pitched roof is involved, something approximating 38’ is the maximum possible distance between supporting walls or pillars – and this is true even for cathedrals ! But there are areas in Lincoln Cathedral – the crossing and the south transept – where the canvas fits, and has been used on several occasions. St Luke’s Church, Birchwood with it’s 1970’s circular conical central area, seemed to have been with this labyrinth canvas in mind. It’s a perfect fit, and greatly enhanced by the lighting. Several workshops have taken place here. Holy Cross Church also has a parish hall which accommodated it for a diocesan training event. It was used at an open day at Bishop Grosseteste University College. The EICH gallery at the University’s Hull campus was another ideal space with it’s very fitting ambience and lighting. to the Northern Counsellors annual gathering at Scarborough where for the first time it was used outdoors – on a tennis court overlooking the sea, and which prompted us to invest in a polythene undersheet. One of the enthusiastic participants at the EICH gallery workshop in Hull was Sister Katherine from the Endsleigh Spirituality Centre, Hull (formerly a Sisters of Mercy convent) . She had long been interested in the labyrinth and now fulfilled her ambition to walk one, but she wanted to have the opportunity more often and invited us to paint one on the disused tennis court in the Endsleigh Centre’s grounds, which we did so, the space available allowing the re-creation a full size-Chartres 11-circle design. The surface – old asphalt – didn’t look too promising for the labyrinth’s longer-term durability, but once again the Centre’s groundsman was enthused as much as he was intrigued. Using his pitch-marking machine, he assiduously followed the chalked-marked design and came to know the design so well that he regularly renews it, keeping the design always to a very high standard in spite of weather-erosion and a crumbling surface. The oldest existing Christian labyrinth is probably the one in the fourth-century Basilica of Reparatus at el-Asnam in Algeria. At its center are the Latin words “SANCTA ECCLESIA,” testifying to its Christian significance. While Christians used labyrinths on pre-Christian sites and modeled their own after ones used by earlier cultures, the development of the high medieval Christian seven- or eleven-circuit labyrinth was a breakthrough in design. 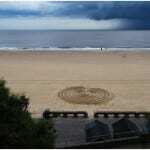 Its path was cruciform, thus incorporating the central Christian symbol. 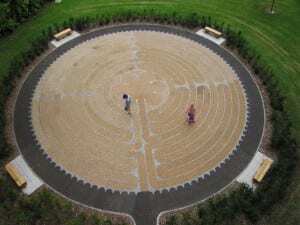 The prayer labyrinth is not a maze and rather has one path on which one cannot get lost, serving as a powerful symbol of individual life journeys and the pilgrimage of faith. Use of these labyrinths flourished in Europe throughout the 11th and 12th centuries and beyond, especially in the French cathedrals of Chartres, Sens, Poitiers, Bayeux, Amiens and Rheims and in the Italian cathedrals at Lucca and Santa Maria-di-Trastevere in Rome. Prayer labyrinths were often viewed and modeled as a journey to Jerusalem and were even called Chemin de Jerusalem (Road of Jerusalem) serving as a spiritual pilgrimage for those who could not afford the expense (or the danger, during the Crusades) of travel to Jerusalem, the center of the world. The faithful often made the journey through the labyrinth on their knees, sometimes taking up to four hours. By the 17th and 18th centuries, the spiritual meaning of labyrinths was no longer understood. Before long, many were destroyed. But the one at Chartres survived, even though it was obscured by chairs and generally disregarded. Almost twenty years ago Lauren Artress, an Episcopal priest and Canon of Grace Cathedral in San Francisco, led a small group of people in moving those chairs in order to prayerfully walk the 42 foot Chartres labyrinth. Her work and her writings since then have brought about a worldwide resurgence in the creation of prayer labyrinths in churches, schools and hospitals from across the theological spectrum. And today the Chartres labyrinth is once again in regular use after 250 years of neglect. The labyrinth is a universal symbol for our path through life, with its complications, difficulties, unexpected turns and twists. 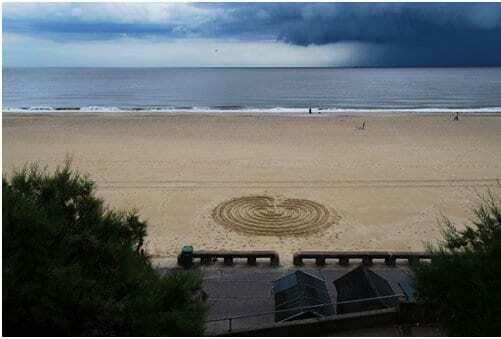 The entry to the labyrinth is birth; the center is death and eternal life. In Christian terms, the thread that leads us through the labyrinth of life is divine grace. Purposefully walking the labyrinth can remind us to step forward in faith, confident that Christ is central and at the heart of our life in God. Like any pilgrimage, the labyrinth represents the inner pilgrimage we are called to make to take us to the center of our being. It can help to quiet the mind, and prepare it to listen for God. It can help one to pray with the heart (instead of with words). It offers opportunity for spiritual reflection and can have peace-producing effects, which appeal to hospitals, cancer and grief support groups, stress-reduction clinics, religious groups, prisons, and families. Visit http://labyrinth.blogs.lincoln.ac.uk/2010/10/18/labyrinths-from-glen-and-rebecca-grrr/ to see more about the beach and garden labyrinths created by Glen Robinson, Graphic Design lecturer at the University of Lincoln. 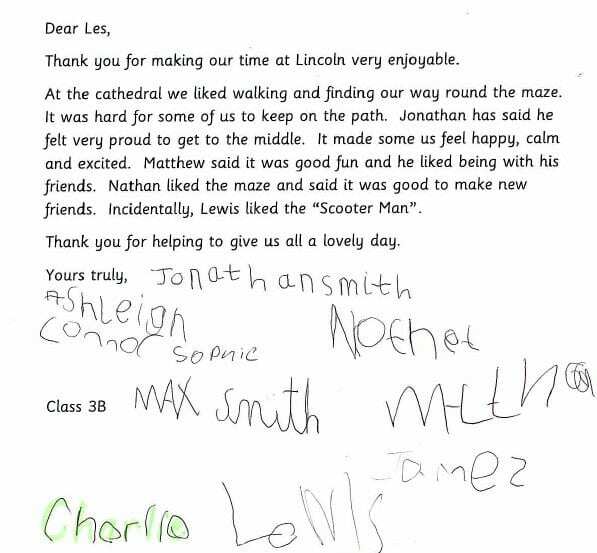 Below is a letter to Les Aklam from the children who walked the Ermine Labyrinth at Lincoln Cathedral (click onto the image to increase size). 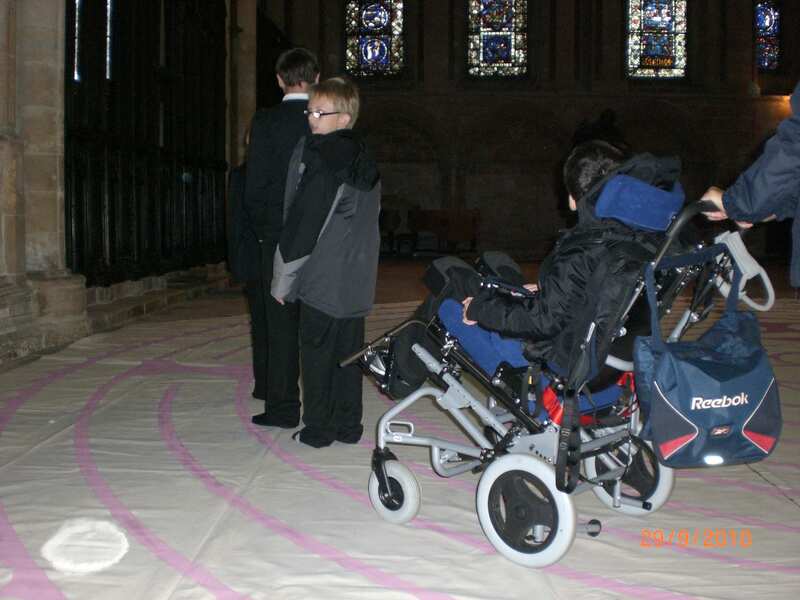 Some new photos from the Ermin Labyrinth event at Lincoln Cathedral; here some children are experiencing a labyrinth walk. 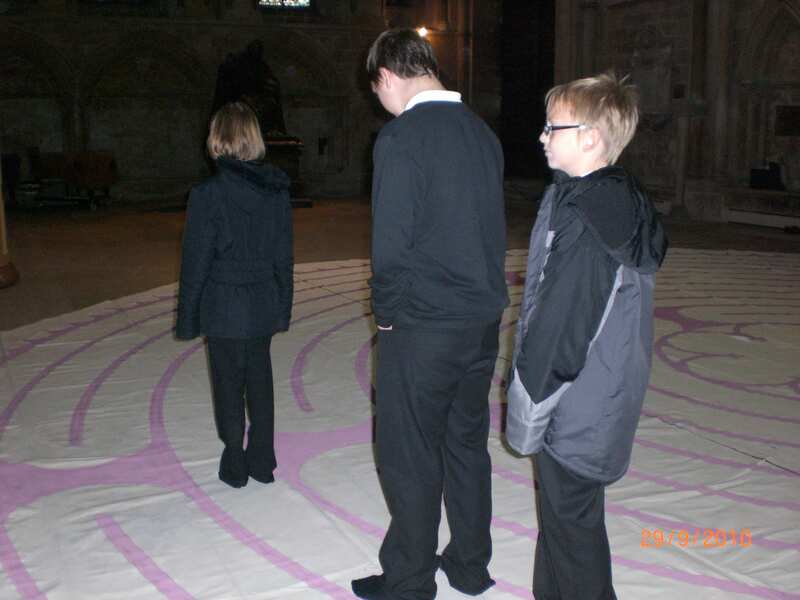 The Lincoln ‘Ermine Street’ Labyrinth was set out in the dramatic setting of Lincoln Cathedral on 29th September by Lincoln University Chaplain Les Acklam. This was part of an activity day for pupils from special needs schools from across the county. 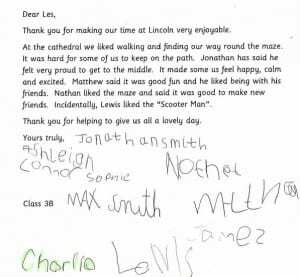 Two workshops were held for two groups of a dozen pupils who enjoyed the experience of walking the labyrinth and were intrigued by its design and history. 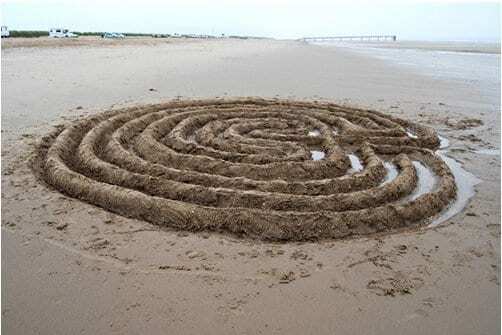 Known as the Ermine Street Labyrinth, this 38 foot canvas travels between the north and the south banks of the River Humber offering an opportunity to walk the circular route to the centre and out again. The replica of the 13th century Chartres Cathedral labyrinth is the work of Les Acklam, University of Lincoln Chaplain and former colleague Eunice Mathers. The picture below shows the labyrinth in situ on the floor of the University of Lincoln Engine Shed in 2009. In March 2010, the Ermine Street Labyrinth was set out in the Engine Shed again. The image below shows both Les and Eunice on the labyrinth under the Engine Shed lights. The Gallery below shows the Ermine Street Labyrinth being dismantled. Archive pictures below show the original creation of the Ermine Street Labyrinth in the University of Lincoln Atrium in 2002, and some coverage from the local press. 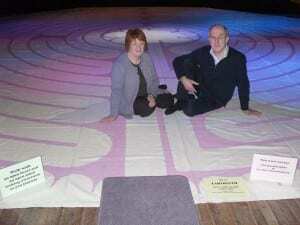 Di Williams, the University of Edinburgh Chaplain, initiated the University’s Labyrinth Project in 2002, using a hand-painted canvas labyrinth. Di had walked labyrinths since 1993 and realised the potential for a project within the University. She was keen to offer the University an experiential, intuitive learning tool which complemented a more didactic approach to education. Di was already involved in creating a chaplaincy provision for the University for those of all faiths and none. The inclusiveness of a labyrinth project would complement this approach. By 2004 work had begun on the building of an outdoor labyrinth in the gardens of George Square to provide more opportunity for walking and expand the labyrinth project by offering outdoor guided walks, workshops and rituals as well as the opportunity for people to simply walk a labyrinth whenever the gardens are open. Text adapted from the University of Edinburgh Labyrinth web pages. First things first: the Labyrinth Project at Kent is part of the University’s Creative Campus initiative, celebrating and fostering all sorts of creative activities, connections, policies and possibilities. More on that another time (or visit our website, http://www.kent.ac.uk/creativecampus/) We have two canvas labyrinths (kept in store, and laid out for specific events) and one permanent outdoor labyrinth (the Canterbury Labyrinth). The labyrinths are beautiful works of art; and quiet, peaceful places for reflection; and a place for teaching and learning. All at once, and I’ll say more about that in a moment. We’ve also got a temporary labyrinth on the edge of the playing field – I won’t call it a beautiful work of art, since I was one of the three who painted it on the grass initially! but it looks fine (I think) and our amazing Grounds team keep the paint topped up. This is in a very quiet corner (except when there’s a match on) and it’s a lovely spot to visit and walk. 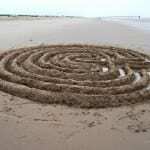 We began the Labyrinth Project to introduce labyrinths for reflection, and for teaching and learning. The Project began in September 2007, and is based within the Unit for the Enhancement of Learning and Teaching (UELT). This is something of a review of how we’ve got on since. 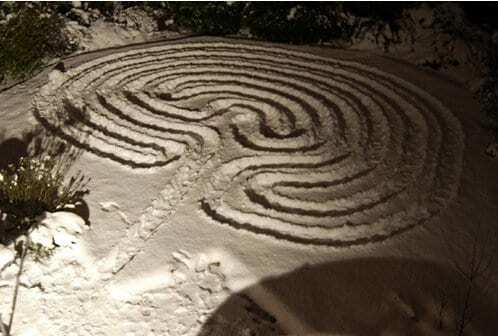 We took delivery of our first canvas labyrinth in January 2008, and then found that there was a lot of interest in the idea of a permanent labyrinth. With huge encouragement from colleagues (many thanks to absolutely everyone), the Canterbury Labyrinth was constructed between May and August 2008 (and formally launched on 17 October 2008). Meanwhile, working with the portable canvas labyrinth, we found out the hard way how heavy an 11-metre canvas labyrinth can be, so we tend to keep that for use on the Canterbury campus. We purchased a second, smaller canvas to use at our Medway campus and ‘on the road’. So how are we working with these labyrinths? Firstly, people just drop by to walk the Canterbury Labyrinth – it’s there for everyone, staff, students and community (and people of any age, to answer that question). It is right beside a footpath and a traffic-free stretch of National Cycle Route 1, on the old Crab and Winkle Line between Canterbury and Whitstable. It has spectacular views of the city and cathedral, and benches nearby – with finger labyrinths engraved in them (look for the left-handed bench!) We hold an introductory talk and walk at least once a month (visit the calendar at http://www.kent.ac.uk/uelt/ced/themes/labyrinth/newsevents.html ) We’ve had several community groups, and groups of students, visit the labyrinth – to use it as a quiet meditative walk, or simply to find out more. Three seminar groups have visited (one from the School of English and others from the School of European Culture and Languages). The canvas labyrinths are rather different. Because we use these indoors, we can use them for teaching very readily, as well as the open walks that we offer several times each term. For example, on campus we’ve included a labyrinth walk in student sessions on wellbeing; on reducing stress related to exams; and on creativity. Staff development sessions have included mindfulness and relaxation. Seminar groups so far include those above, and coming up is a session with Foundation students from the Centre for Professional Practice (Medway). Off campus, I’ve led sessions with Foundation Computer Science students at Middlesex University (looking at ways of taking a calm approach to university studies) and with MBA students at Cass Business School (deepening reflection as managers of the future, and looking at career journeys). At conferences, sessions have included a reflection on core values as academic developers; and creative reflection for Arts academics. The next event is at the conference of the National Association of Writers in Education, in Hampshire, jointly with Patricia Debney of the School of English here. This has been a long blog – but I’ve made a start! I hope this gives a sense of how we are working with labyrinths, and where we’ve got to, in the past couple of years. 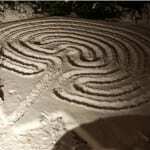 Four of us are qualified as Veriditas labyrinth facilitators – this simply means that we’ve undertaken some intensive training which has really been worthwhile in my view. This opportunity will be available in the UK for the first time in September 2010 at the University of Kent – very much in the planning stages but watch this space! We also plan two days of labyrinth events in April – more news later.